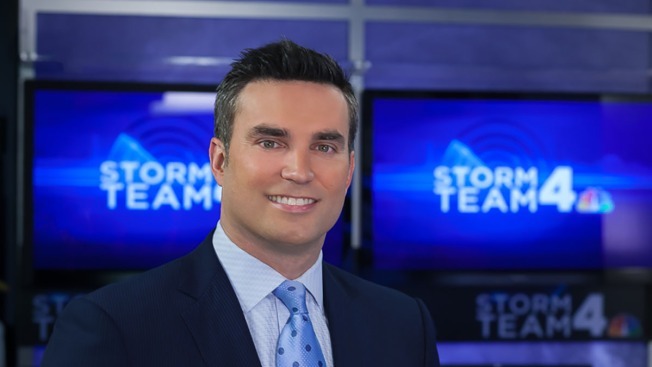 Doug Kammerer is News4’s Chief Meteorologist, forecasting the weather weekdays on News4 at 4, 5, 6 and 11 and working with NBC4’s team of meteorologists to bring viewers the most accurate, complete weather information on air, online and on 103.5 WTOP Radio. Doug joined News4 in August 2010, but he’s no stranger to the Washington, D.C., area. He grew up in Herndon, Va., attending Herndon High School and Herndon Middle School. Doug has studied and forecasted the weather in Orlando, Jacksonville, and Macon, Ga. and spent seven years in Philadelphia at KYW-TV, The CW Philly, WCAU-TV, and WPHL-TV. He has covered the elements all around the country firsthand, trekking to the top of New Hampshire’s Mt. Washington (site of “the worst weather in the world”) and reporting from the eye of Hurricane Frances for NBC News. Doug holds a degree in Meteorology from the University of Northern Colorado. He and his wife Holly live in Maryland along with their son and daughter. Follow Doug on Facebook by clicking here. Send Doug Kammerer an e-mail.